myGeoTracking has been evaluated by FitSmallBusiness, a premier publication for small business owners, on its features and pricing that perfectly fit small, mid, as well as enterprise level organizations! myGeoTracking is thankful to FitSmallBusiness for the detailed assessment. It is a trusted go-to source for small-sized business owners and myGeoTracking urges its customers to kindly visit FitSmaillBusiness.com and rate the product they have been so passionately using. And, don’t forget to rate & comment on myGeoTracking’s accurate time tracking, effortless field data collection, seamless integration with third party softwares, active support service and other add-ons. Go ahead and review us, your feedback matters! This entry was posted in myGeoTracking General on - by myGeoTracking. Field data collection is a weary and tiresome task, and carrying it out with paper forms only makes it worse. It’s no wonder why businesses are opting for mobile forms that make the data collection so effortlessly smooth. Mobile forms have upheld an impeccable image of bringing-in accurate data on time and rocketing the productivity through the roof! But first of all, what is a mobile form? And what gives it the edge over paper forms? Let’s take a look. A mobile form is a digital form that runs on a smartphone (or tablet) app and enables you to collect data. Using mobile forms is not just a trend, but simply a better way to go about collecting data. With mobile forms you can collect any type of data, such as text (notes, forms field inputs), photos, signature and more. Managing paper forms creates lot of work and potential errors. The forms need to be transported back and forth from the field to the office for processing. The data entered may be erroneous and also processing the information alone consumes a lot of time for the back office. Using mobile forms offers a host of benefits for your business: speed, efficiency, accuracy, and savings. These benefits can become your edge over the competition! Easy Field Data Collection: Collect on-field data (online as well as offline) with mobile devices by turning them into a smart data-collection tool through myGeoTracking app. Use custom forms to record customized data. Collect actionable data such as pictures, signatures, and run QR/barcode scans. Better Workflow: Collect, save, upload, and share the data with different company’s stakeholders in real time. Submit forms from the field to the back office with a push of a button while removing the hassle of re-entering the information into a system before it can be analyzed. Dispatch forms to the phones in real time to field employees. All the data from collected forms can be shared with various business units and integrated with different systems, such as CRM and payroll. Better Accuracy: Mobile forms are more accurate and customized to fit your needs. You can set up smart fields within any forms: auto-computed fields, required or mandatory fields, and validation rules to minimize user errors. Set up rules to validate data and generate real-time exceptions. Always Available: With modern mobile forms applications such as myGeoTracking the forms can be accessed and filled out both online and offline. The form filled information or the data can be made available to the right people or teams in real time. Businesses like myGeoTracking offer digitization of paper-driven data collection. The ease and speed of adaptation have relatively increased than before, and the app-based mobile data collection softwares are straightforward to use so you no longer need to spend hefty amount of funds to train your staff to use such technologies. In a nutshell, using modern mobile forms to collect field data for your business will cut down your costs , improve efficiency and accuracy with a better workflow. myGeoTracking helps SMBs and Enterprise businesses better manage mobile workforce and field operations with tools such as real-time location, GPS time and attendance, geofence visit logs, Lone worker safety, Mobile forms and more! All the tools can be highly customized to fit each use case. The platform features powerful rules engine and integrates with popular back-end CRM, HRMS, and Payroll systems to automate day-to-day operations. myGeoTracking serves customers from a wide range of industry including field service management, trade services, emergency responders, sales reps, transportation & logistics, oil & gas, home health care providers. These customers do report improvement in productivity and savings in payroll. This entry was posted in Facility Management, Mobile Workforce Management, myGeoTracking General on - by myGeoTracking. Field Service Automation allows you to streamline your field operations to boost the overall efficiency and productivity of your mobile workforce. It also helps you centralize all your company’s data and makes that data accessible to all teams at all times. Modern platforms include powerful features that encompass all functions involved in field operations. These functions include time and attendance monitoring, payroll, field data collection, employee safety monitoring and escalation, compliance monitoring for regulatory requirements, customized business rules and exception reporting, integration with back-office systems and more. Every business has its own unique way of doing things, and the same is true with field operations. One of the most important traits of a good field service automation software is its ability to be customized to fit in with your unique business style. With features that cover the entire field service workflow, all the day-to-day tasks can simply get automated: the back-office operations team assigns jobs to the field technicians directly via the scheduling, planning and work order system. Once the job assignments are dispatched to employees, the FSA system starts monitoring attendance and reports any exceptions and delays to back office for contingencies. Meanwhile, the field technicians collect data from the field via the mobile app and make the data available to other teams instantly. Finally, all the data gets pushed to respective back-office systems such as CRM, accounting and payroll making the entire process seamless. Automation Setup : Create a work plan for your field techs and assign jobs. If you use a third-party scheduling software, just connect it with myGeoTracking. The system automatically records employees’ attendance and hours of service using Geofencing. Daily Dispatch Reminders: Assigned jobs get sent to employees via text, app notification or IVR call. You can also send manual or automated reminders to your employees regarding shifts and tasks at the jobsite. Field Data Capture: Your field techs can collect on-field data with mobile forms, capture signatures and photographs, scan QR codes and more. Real-Time Alerts: Set up custom rules to get notified based on any event in the field involving people, place and time, such as arrival or departure from a jobsite, or unscheduled stoppage. Integration with Back Office: Integrate mGT FSA with your back-office ERP, CRM and FMS systems using web APIs. According to TSIA, around 52% of service companies still use manual methods for the bulk of their field service tasks. So it’s likely that your competitors haven’t rested their pens and papers yet. 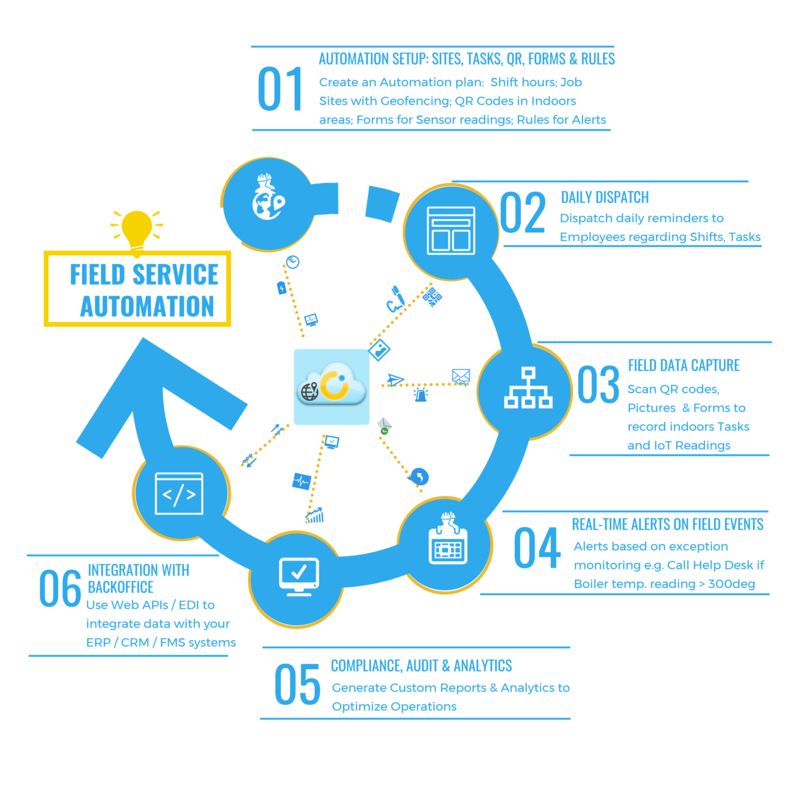 Field Service Automation goes beyond savings and productivity gains, it can give the competitive edge to your business. The benefits of cost reduction and gains in productivity from field service automation are tangible and measurable! Healthcare: myGeoTracking deploys a highly customized SaaS and mobile phone solution that complies with EVV. The solution includes IFTTT workflow triggering business actions, GPS location tagged messaging and notes, time tracking, and caregiver performance analytics. Property Management: The myGeoTracking app combined with geofencing of property sites will automatically record each employee’s time and attendance at the facilities and job sites. Taking notes, scanning QR codes, and integrating with backend property management software are some more features offered by myGeoTracking. Sales Reps.: Integrates with CRM to set up schedule on planned visits for the day. Automates visit tracking and logging back into the CRM. The reps use the mobile apps to fill data relating to customer visit. Construction: myGeoTracking’s field service automation allows construction companies to deliver seamless on-site services by deploying work order via app, and managing tools inventory via QR codes and forms. Track your employees’ hours of service and keep track of job-site attendance with geofence, and integrate your Payroll software with back-end. A Geofence is a virtual boundary around a predefined real-world area of interest. A virtual perimeter (geofence) can be put up using a geofencing software. Modern workforce management tools such as myGeoTracking use a combination of GPS, cellular data, and WiFi signals to accurately detect time-clocking activities. This helps with in-visit verification of a worker on a job site, eases attendance verification, and enhances the accuracy of billing employee work hours. Geofencing can help automate operations workflow using rules and triggers. Very few modern tools, like myGeoTracking, support custom work rules that leverage geofencing to automate your business operations. Good service and timely deliveries make a huge difference in load transportation business. Do not forget to go an extra mile for the security of high-value, high-risk and time-sensitive freight. A geofence, in this case, helps you to know when a driver is close to the destination or is heading where they shouldn’t. Monitor time spent at a location and alert drop locations of an incoming arrival. Say goodbye to “Give me a call when you get there”. Geofencing can also boost the positive side of your customers’ experience by allowing fleet management to understand which assets are in a particular area and therefore, with additional statistics and information, directing the assets to meet customer demands. This helps companies to better serve the existing as well as potential new customers and enhance customer experience. Creating location-based geofenced marketing campaigns can truly transform all facets of your business. Serving ads and other promotional content to individuals while they are at the geofenced location and after they leave. Ads can also be set up to send phone messages to consumers who happen to be passing their preferred retail stores. This strategy increases brand awareness and can reduce the cost of marketing considerably. myGeoTracking is a cloud-hosted, carrier-grade location and messaging platform that helps SMB and Enterprise businesses better manage their mobile employees by improving productivity and accountability, while reducing payroll and operations costs with solutions such as GPS tracking & time clock, Lone worker safety, Automation of field activity monitoring, Mobile forms & data collection including signature, notes, pictures, barcode/QR code, etc. The myGeoTracking platform enables these solutions across a wide range of industries such as field service management, trade services, emergency responders, sales reps, transportation & logistics and home health care providers. This entry was posted in Mobile Workforce Management, myGeoTracking General on - by myGeoTracking. Time is money. Who knows this better than the hourly workforce? The more time you spend on the job (working), the more you get paid. Traditionally, clocking in and out of a work (the job site) has been carried out through punch card machines, paper timesheets logs, and swipe cards. But keeping track of billable hours and processing of payroll through these methods has always been tedious and time-consuming and error-prone task for the back-office operations. Let’s take a look at these solutions. Modern Time clock software are very affordable and offer highly efficient means to track time, even for small businesses! Here’s how a typical solution works: It allows employees to check in and check out across your company’s network with a click of a button. It also allows them to log both billable and non-billable hours. With modern time clock apps like myGeoTracking, the employees’ smartphones can be transformed into portable time clocks by simply downloading and installing the app on their device. This will help them to clock in and out as soon as they start and finish their job. Saving a lot of time on paperwork for both employees as well as the employer. IVR stands for Interactive Voice Response and as the name suggests is a voice-based system where the employee or the worker who is usually remote or works at client’s or customer’s place, is able to clock in/out by placing a phone call to a dedicated phone number. The employee just follows the voice prompts to log their time and attendance. Smart systems like myGeoTracking can provide location data about the place from where the phone call was made! Provide your employees with easy access to clock in and out directly from their mobile phone by using text messaging. The employee simply sends in their text command to clock in/out. Such systems can log their times based on the incoming message and the command used. Some smart systems like myGeoTracking can do more than just logging the time, it will also record/log the place from where the message was sent. This way the employer can check or any fraudulent behaviors (such as employees clock in from home etc.). myGeoTracking is a cloud-hosted, carrier-grade location and messaging platform that helps SMB and Enterprise businesses better manage their mobile employees by improving productivity and accountability, while reducing payroll and operations costs with solutions such as GPS tracking & time clock, Lone worker safety, Automation of field activity monitoring, Mobile forms & data collection including signature, notes, pictures, barcode/QR code, etc. The myGeoTracking platform enables these solutions across a wide range of industries such as field service management, trade services, emergency responders, sales reps, transportation & logistics, and home health care providers. Time theft is when an employee receives payment for time he/she did not put into work. When an employee gets paid for more work hours than he/she actually worked, the employee is committing time theft. Essentially, the employee is stealing time from the company. There are countless ways to carry out time theft in a workplace. One of the most common ways is buddy punching. Buddy punching occurs when one employee is running late or is absent from the workplace and a colleague clocks in for him/her. This practice helps employees sneak a few minutes here and there on time cards. Clocking in and out for other colleagues adds thousands of unearned dollars to companies’ payroll costs each year. In 2016, according to data from the Census Bureau’s Annual Survey of Entrepreneurs: Total employer firms in USA were 5.6 million, out of which 89% were firms with less than 20 employees. In an independent survey of 1,000 employees conducted by Pollfish, in 2017, found 16% of the employees admitting to buddy punching. A data published by U.S. Bureau of Labor Statistics tells that there are 78 million hourly workers in American workforce. The APA estimates that over 75% of companies lose money from buddy punching. In firms with <20 workers, nearly 4.5 hours are poached by employees every week through buddy punching. This accounts for a total of approximately $350 million worth of capital lost to buddy punching each year. Buddy Punching is a very serious breach of trust and should be considered as fraud. Companies should have firm policies against buddy punching and inform their employees that such practice will lead to disciplinary actions. Why Do Employees Buddy Punch? If there is a recurring or an increase in an employee tardiness, you should definitely review the employee’s timesheet and check for discrepancies. Recurring tardiness may lead to time theft and time theft could hide buddy punching. Buddy punching is a common problem in companies where timesheets, swipe cards, tags, or proximity cards are used by employees to clock in and out. These kind of outdated clock-in clock-out methods are easy to manipulate. Addressing buddy punching as time theft is a must. Perhaps your employees are unaware that they actually are stealing from their own company. Having a quick word with your team about this and providing additional support for your employees can help. Make sure the message reaches everyone and not only a few members of the team. How to Fix Buddy Punching? Openly addressing the problem and implementing a policy can help you kick-start your battle against time theft in your company. Explain them how concerned you are about the accuracy of their timesheets and that you take the issue seriously. GPS Tracking solution can help employers resolve buddy punching. Integrated timekeeping software and mobile GPS in a single application can help you track both the employee location as well as hours of service. Today’s timekeeping solution come with GPS’ stamp on employee location which enables them to clock in and out within a defined radius, making time theft or buddy punching very difficult. A modern cloud-based time clocking system can reduce buddy punching. This solution works on any cellular device, tablet or computer, and includes a photo with a location and time stamp on it. Geofence is a virtual barrier created by an employer around a jobsite. It confines the space from where an employee can manually clock in and out from a jobsite. Choose to be notified when a particular device enters or exits a given geofence automatically. When this action is triggered, the system sends a message to the manager with data in real time. These solutions that help you tackle buddy punching, resulting in better HOS calculation, and more accurate payrolls. This entry was posted in Mobile Employee Time Clock, myGeoTracking General on - by myGeoTracking. Field service professionals use multiple platforms throughout their workday to fulfill their to-do list. These platforms and practices transcend manual data entry and form scribbling to include mobile phones and computers. In the process of navigating between different technologies, applications, and storage units, field employees lose a notable amount of productivity. Balancing the different systems employees utilize to conduct their field work often costs them an excessive amount of time and money. Field employees can find themselves alternating between several mobile applications in just in a day. Switching between various applications, platforms, and software can decrease productivity during work hours, when time is spent managing systems instead of fulfilling work duties. Field teams require training for the applications they rely on daily. This training can be costly, lengthy, and difficult to schedule or implement. Participating in mandatory training takes the place of hours of work that could be performed instead. Paying employees to participate in frequent trainings also poses another additional cost for companies. Multitasking becomes ingrained part of the work day when field employees are constantly switching between systems. This level of fluctuation increases the likeliness of mistakes related to data entry and other important tasks. Subscribing to a number of applications for your field team can result in a pricey monthly or annual bill. Spending excessive money on multiple workforce management softwares can deduct from your business’s bottom line. Consolidating your field activities allows for more efficient data entry and storage in a cloud-hosted secure platform. Replacing multiple apps with one that is comprehensive and powerful can result in impressive savings for your company. For a team of 50 people a multi-vendor approach can end up costing $500,000 in savings and productivity gains. We believe the future of workforce management will emphasize efficiency and effectiveness. myGeoTracking’s comprehensive features and abilities are setting the standard for this shift in expectations. Employee GPS tracking is becoming more common in workplaces. With the improvement of SatNav systems and the increased use of smartphones, many businesses have adopted GPS tracking system to track their employees in order to monitor their work throughout their hours of service. Over the last few years, the cost involving installation of tracking software in handsets has decreased, allowing small to medium business (SMB) owners the opportunity to begin tracking their mobile workforce without worrying too much about the overhead cost. The data recorded by the tracking system can be used to hold both employers and employees accountable for meeting their responsibilities. GPS data can be a powerful piece of information for keeping the employer-employee relationship fair. However, there is a difference between monitoring employees for the purpose of work and invading their privacy. Employers need to respect their employees’ right to privacy while tracking them. Employers need to have a policy in place informing their employees that their device has a GPS tracking app installed on their phone that will monitor their whereabouts. Employees should be aware of and understand all the capabilities of the tracking app, including time-clocking, mileage tracking, driving routes, and so on. Each and every one of those functions should be explicitly disclosed to diminish the employees’ expectation of privacy while on a job for the company. There are a number of states that limit the legal use of GPS tracking devices. For example, the California Penal Code Section 637.7 limits the installation of a GPS tracking device that determines the location or movement of a person. Minnesota’s statute prohibits the use of a mobile tracking device without a court order. Similar laws involving GPS tracking use case can be seen in Tennessee and Texas Penal Code. Though there are laws stipulating how employees can be legally tracked by employers, it is still a better option to walk them through the actual circumstances under which they will be tracked. Information should come before implementation. Employees have every right to know about each and every function of the GPS tracking system and understand how and when it is going to track them. This will encourage employees to build up trust. It is important that employers build a transparent relationship with their workers. While introducing GPS tracking to employees, discuss how such system will benefit them directly. If utilized in a correct manner, employee GPS tracking can help the business grow by increasing job efficiency, serving more customers, and increasing customer retention. This, in turn, will generate more revenue for your business and create more opportunities for incentive programs, increased salaries, and reward bonuses for employees based on their performance. Present your employees an opportunity to voice their concerns. Answer their questions thoughtfully and honestly. Increased productivity is essential for a business to flourish and employee GPS tracking system can play an important role in achieving that. Make them realize it isn’t about the management doubting their work ethics at all. If they don’t have anything to hide, then there should be no reason to worry in the first place. Illustrate how GPS tracking protects them as well. The tracking system can show the location where a field worker was located and help solve issues in the event that a client says he did not receive a service from the concerned worker. Also, GPS employee tracking in remote areas and areas with high crime-rates can help protect on-field working employees. Host an information session in which you can explicitly outline the benefits that employee tracking can bring to your business. When employees understand the tangible benefits that field tracking offers to your daily operations, they are more willing to participate. In order to create a transparent tracking policy, employee consent should be given. For mobile tracking systems that operate from an app, employees must willingly download the app on their phones in order to use the platform. Under Connecticut and Delaware state laws, the use of electronic surveillance, including GPS, is prohibited without employee consent. Your business should enlist a tracking platform that offers strong privacy controls. Ethical tracking should occur only during shift hours. Participate in a question and answer session with managers, HR, and affected employees. Any questions that cannot be answered by your staff can be directed to your tracking service provider in order to best address employees’ concerns. Do not track employees without their knowledge. Discuss the benefits and acknowledge their concerns. Don’t let employees figure out the answers for themselves. Explain that the purpose of GPS tracking is not to get employees in trouble but to make improvements to your daily operations. Do not expect your staff to accept this change, at least not immediately. They might resist the change, but once the practical benefits start making sense to them and their fears of being “spied on” allayed, they will get on board. “My employees won’t trust me if I track them”; “It’s too expensive”; “It’s difficult to use”; “I trust my employees so it’s not needed”; “My company is too small to need GPS tracking”. Don’t let the myths prevent you from outfitting your mobile workforce with GPS tracking. There is so much this technology can bring to your company at a low cost. Several federal and state laws hold businesses accountable for the well being of their employees. While successful businesses are dedicated to employee safety, many still view measures taken to protect employees as a financial burden. We challenge business owners and decision makers to change the misconception that compliance is a superfluous cost, and instead embrace the tangible savings of compliance as a return on investment (ROI). The chance of entering a lawsuit due to a compliance mistake can pose thousands of dollars in costs for your business. Legal fees can quickly pile up. Consequential reputation damage can have costly effects on your business as trust and goodwill is lost. A breach in compliance can happen on a number of levels. Whether a violation is made on the state, federal, or industry level, subsequent fines can be expected. For example, the Occupational Safety and Health Administration (OSHA) agency enforces statutes and regulations that many industries abide by. A serious violation can result in a fine of up to $7,000. A repeat violation costs $70,000. While, a fatal incident can reach a fine of $500,000. Ensuring safety and compliance within all compliance requirements your business is subject to will save up to hundreds of thousands of dollars. OSHA states 1915.84(a) (1) “Throughout each work shift at regular intervals appropriate to the job assignment to ensure the employee’s safety and health; and”1915.84(a) (2) “At the end of the job assignment or at the end of the work shift, whichever occurs first.” 1915.84(b) “The employer shall account for each employee by sight or verbal communication.” Smartphone applications can support the stringent communication requirements OSHA holds employers accountable for. In addition to physically tracking the location of the lone worker, these applications allow for many methods of instant communication. Text and voice messages allow for easy, consistent contact between employers and lone workers that fulfills OSHA standards for communication at regular intervals. Workforce management apps can almost completely automate safety and compliance tasks in line with NIOSH and OSHA instructions. With situations similar to those employers face in the state of California, advanced workforce management apps can send alerts to employees when the temperature reaches 95 degrees. Employees are then notified to take the required break time within a two-hour period. Employer and employee productivity is increased as each party does less to ensure that workers are safe in their work environments and employers are complying with state and federal laws and recommendations. As companies grow, they become more vulnerable to disaster when compliance standards are violated. Already costly fees multiply the larger businesses become. Your compliance system should be able to expand with your company across work sectors and geographically across borders. A lack of compliance-related incidents creates an encouraging environment for business while avoiding a loss in productivity and money. Putting a relatively small amount of funding into a strong and efficient compliance system allows your business to keep doing what it is meant to instead of dealing with the lengthy hassles of possible compliance breaches. This entry was posted in Healthcare, Lone Worker Safety, myGeoTracking General on - by myGeoTracking. GPS tracking can be an effective supplement to your business field-team operations. The growing popularity of GPS location services for workforce management allow business owners to have greater insight into the daily activities of field employees. Field employees have a unique level of independence in the daily work they conduct. By implementing a tracking solution, employers can establish accountability among their workforce. Host an information session in which you can explicitly outline the benefits that employee tracking can bring to your business. When employees understand the tangible benefits that field tracking offers your daily operations, they are more willing to participate. Participate in a question and answer session between managers, HR, and affected employees. Any questions that cannot be answered by your staff can be directed to your tracking service provider in order to best address employee concerns. myGeoTracking is a cloud-hosted, carrier-grade location and messaging platform that helps SMB and Enterprise businesses better manage their mobile employees by improving productivity and accountability, while reducing payroll and operations costs with solutions such as GPS tracking & time clock, Lone worker safety, Automation of field activity monitoring, Mobile forms & data collection including signature, notes, pictures, barcode/QR code etc. The myGeoTracking platform enables these solutions across a wide range of industries such as field service management, trade services, emergency responders, sales reps, transportation & logistics, and home health care providers. Healthcare providers in a variety of industries, such as home health, community health, hospice have traditionally used paper forms to record their caregivers daily visit log amongst other logistical recordings. These methods have been prone to errors that only multiply as your operations scale. Errors range from data entry mistakes to plain old “dog ate my forms.” Transcribing hand-scribbled notes during patient visits is also challenging. Old-school digital technologies (pdfs, excels) have gone a long way in mitigating some of these issues but are not ideal. These order entry methods cost an enormous amount of time and money. For Field Healthcare providers, handwriting daily summaries can be a tedious and time-consuming task; trying to remember details to record later can result in hindsight bias, and can affect the accuracy of information. Paper printouts of relevant caregiver forms including duty checklist and daily log forms is also very expensive and wasteful. All these limitations reduce the productivity of the health-care providers to provide effective services in the field while also impacting customer satisfaction. To truly capitalize on modern-day tools and remain compliant with strict state and federal requirements, healthcare providers with caregivers will need to transition to the mobile phones and caregiver apps, with always-on connectivity and access to up-to-date patient information at their fingertips. Healthcare providers, small and large, are turning to mobile apps to use advanced form capabilities that are otherwise not available on paper. Apps can store forms and other related data in the secure and reliable cloud system. Form data can be available on multiple systems for multiple users and can easily share evolving information in real time. Additionally, automation allows the configuration of alerts based on data input in real time. Never encounter another case of the human error that can take place when using paper forms. Mobile forms eradicate the hassle and cost of paper forms. The flexibility offered by creating, editing and sharing forms in real time establishes mobile forms as an advantageous supplement in any industry with field employees, notably the healthcare industry. Home-care service providers are heavily dependent on the use of multiple forms for their daily tasks. Under the 21st Century Cures Act, all Medicaid personal and home health-care providers have to implement Electronic Visit Verification (EVV) by 2019. The Federal EVV mandate requires affected providers to electronically verify: the type of service performed, the member receiving the service, the date of service, the location of service delivery, the care provider responsible for the service, and the time the service begins and ends. Use mobile forms as a simple solution to reporting this variety of data. Make home-care visits more efficient with immediate access to the patient data and use mobile forms to retrieve and update the data. Tackle any sudden maintenance or repair issues with customized reporting and tagged GPS location. Messaging, signature collection and photo capabilities can supplement any healthcare scenario. The myGeoTracking platform also supports a powerful IFTTT (If-this-then-that) workflow rules engine. The IFTTT rules engine translates real-world events to trigger business actions. With this, you can define your business workflow and myGeoTracking can automate field operations using real-world triggers involving people, places, and time. Both events and subsequent triggers can be highly customized for your businesses specific workflows. This entry was posted in Healthcare, Mobile Workforce Management on - by myGeoTracking. With improvements in technologies carrying out field data processing, there has been an increasing adoption of technology-driven data collection using apps over paper forms. Modern software solutions have been able to replace paper-based forms with digital forms which are accessible via smartphone app in any working conditions. Industries like Healthcare, construction, maintenance have already observed a drastic increase in use, efficiency, response rates, feedback, and accuracy of data collection through data capture apps. These data collection apps enable the respective field operators to collect the data faster as well as make constant improvements if need be. However, majority of these apps need a constant internet connection to carry out work, they fail to perform in remote areas and areas with less connectivity. This impacts the efficacy of your business operations resulting in loss of valuable man-hours and failure to collect critical work-related data. According to The World in 2011 ICT Facts and Figures, “90% of the world’s population lived in areas with 2G coverage, while 45% lived in areas with 2G and 3G coverage.” And since 2017, more than 90% of the world’s population has access to at least 2G internet connectivity. But still, none of these figures tell you about the real-life struggles related to field work such as data inconsistency and incompleteness, scalability, timeliness, and security–especially in remote areas. To counter this glitch, myGeoTracking has developed a solution that enables the field data collection to take place even in the absence of internet. myGeoTracking is a cloud-based mobile data collection app helps you capture, store and view your captured data without requiring access to internet. myGeoTracking app enables you to collect field data in the form of QR, forms, notes, pictures and signatures, safe & smooth even in the absence of network. This feature not only helps you gather data in low-connectivity remote areas but also keeps it safely stored. Attachments you collect on the field through the app will be saved and then sent to the system when an internet connection is established. The app can run offline and will keep storing the data collected in local memory and push it to servers when connectivity is restored. Once the connectivity is restored and the data is pushed to servers, it can be accessed by other members of your team to take further action as necessary. This helps save a lot of time and makes workflow seamless between different teams of the same organization. Build, customize and deploy your mobile forms within minutes without the need of a server or coding proficiency. myGeoTracking is a cloud-hosted, carrier grade location and messaging platform that helps SMB and Enterprise businesses better manage their mobile employees by improving productivity and accountability, while reducing payroll and operations costs with solutions such as GPS tracking & time clock, Lone worker safety, Automation of field activity monitoring, Mobile forms & data collection including signature, notes, pictures, barcode/QR code, etc. The myGeoTracking platform enables these solutions across a wide range of industries such as field service management, trade services, emergency responders, sales reps, transportation & logistics and home health care providers. We live in a world that seems to have a ‘form’ for everything. Survey forms, maintenance forms, healthcare regulations forms, federal forms, employment forms, inquiry forms and the list goes on. Forms have existed for a significant amount of time, and now can be found everywhere in your organisation. In fact, almost 80% of all the docs scanned, printed and processed are some kind of paper form. Organisations associating field operations undergo many form fillings each day. Going from one client to another, jotting down each and every detail about the transaction/interaction that took place is easier said than done. Not to mention, what happens when a field representative needs custom particulars for different clients? Time to print a new one! In a recent survey by AIIM, it was found that to print, distribute, mail, collect and sort, prior to either scanning or paper-based processing, a single document or paper form for an organisation or a business costs $4.56 on an average. It may not seem much initially but when the operation is on a larger scale solely depending on them, the numbers might seem to climb rapidly. Consider 5 field employees, using 5 forms a day, 5 days a week for the entire year, brings you roughly around $6,000, and this is only 1 form per day per employee. Now consider the same 5 employees using multiple forms each day for the entire year. The $$ grow fast. Using paper forms are likely to cost the businesses tens of thousands of dollars, possibly even more on the dependability and accountability front. Not only this, the data collected could also turn out to be unreliable as the physical documentation of any data includes the conditions that could be out of user’s control like miscommunication, misinterpretation, climate, fatigue etc. Paper, scanner, printer, printer toner, other printer hardware costs to print out forms and all associated documents to accompany the application. Also, the fax machine and the cost of faxing through it. Stationery items like files, folders, stapler and staples, paper pins, filing trays, file cabinets, shredder etc. used to organize paper forms all add up to the cost steadily without standing out. A form received as paper may be required to be digitized before it is processed. The same adds to the man hours required to scan, index and store the image of the original form. Not to forget, the ‘deciphering’ of some illegible handwritings. All these add up to countless man hours wasted over re-entering the details from a document or form into a digitized system. Sometimes, forms could be lost in the transit as well, resulting in labor wastage in finding, or in some cases, filling the form again as well. Travel costs if the physical forms need to be picked up from or dropped somewhere. The security of these could also be quite consequential, especially, if they contain privileged or sensitive information. Since dealing with dynamic paper forms, one needs to have a space set-up just to store the data as well. A standard 5-drawer filing cabinet costs roughly around $1,000. Assuming this type of cabinet only consumes 15 square feet of the office space, the average cost of office per square feet is about $20 per square foot amounting to $300 for a filing cabinet. Adding up to this, the strict retention policies of some companies result in purchase of more of these utilities causing them to seek off-site storage facilities opening floodgates to monthly rental charges. Along with these costs, paper forms isolate the field data collection team from the back office teams, which are fully equipped with updated tech, and are left collecting the information with manual, out of date assets. This results in miscommunication, slow response times and also provides just a little room for optimization. The digitization of this delivered data consumes a lot of time resulting in compilation of stale data which may no longer be applicable. Learn how you could use mobile forms to collect customized field data. This entry was posted in Mobile Workforce Management on - by myGeoTracking. Sales and support reps in a variety of industries, such as wholesale distribution, manufacturing, or consumer surveys have traditionally been using paper forms to record their field activities, e.g. sales disposition forms, dealership enquiry form, work order forms, and customer survey forms. Some of these users are also using digital variations of these forms, PDFs and Excel Spreadsheets. But these methods have been prone to errors that only multiply as sales operations scale. Errors range from data entry mistakes to plain old “dog ate my forms.” Transcribing hand-scribbled notes while on the road is also challenging. Old-school digital technologies (pdfs, excels) have helped with mitigating some of these issues. However, these order entry methods cost an enormous amount of time and money. For sales reps in the field, handwriting orders on a form can be a tedious and time-consuming task. Paper printouts of relevant sales docs, including catalogues, is also very expensive and wasteful. All these limitations reduce the productivity of the sales reps while also impacting customer satisfaction. To truly capitalize on modern-day tools these customer service and field sales reps need to transition to the mobile phones and apps, with always-on connectivity and access to up-to-date customer information at their fingertips. Companies with sales reps are turning to mobile apps to utilize advanced form capabilities that have previously been unavailable. Apps can store forms and other related data in the secure and reliable cloud system. Form data can be available on multiple systems for multiple users with easily shared evolving information in real time. Additionally, automation allows the configuration of alerts based on data inputted in real time, notifying management when further actions are needed. Never encounter another case of the human error that can take place when using paper forms.The flexibility offered by creating, editing, and sharing personalized forms in real-time establishes mobile forms as an advantageous supplement in any industry with field service monitoring, notably within sales positions. Build highly customizable forms to use in the sales process. Input your own formatting, rich media, and adjust text and numeric fields. These forms can be updated easily and allow your sales rep to promptly adjust to any situation. Dispatch up-to-date assignments to sales reps with relevant information such as list of customer visits to make, best route information for these stops, and up-to-date customer-specific tasks. All of this can be delivered via a mobile form(s). Read customer-specific assignment details in the form. Take notes and other sales disposition Information on the spot. Handle evolving information with ease. Change quantity values, product descriptions, and more on the forms you need. Include notes, high-quality pictures, and even collect customer signatures electronically. Eliminate the time-consuming process of updating information on multiple platforms. Email filled out forms to relevant department to save time in order processing. Create real-time escalation to finance and management departments to get approval on special customer quotes. Property management representatives in a variety of industries, such as real estate, facility management, storage management, commercial property management, have traditionally used paper forms to record their field activities, e.g. property evaluation forms, rental applications, contract agreements, and more. These methods have been prone to errors that only multiply as the use case becomes larger. Errors range from data entry mistakes to plain old “dog ate my forms.” Transcribing hand-scribbled notes while on the road is also challenging. Old-school digital technologies (pdfs, excels) have gone a long way in mitigating some of these issues. These order entry methods cost an enormous amount of time and money. For property management representatives in the field, handwriting orders on a form can be a tedious and time-consuming task; paper printouts of relevant forms is also very expensive and wasteful. All these limitations reduce the productivity of the sales reps while also impacting customer satisfaction. To truly capitalize on modern day tools these sales and customer service reps will need to transition to the mobile phones and apps, with always-on connectivity and access to up-to-date customer information at their fingertips. Property management companies, big and small, are turning to mobile apps to utilize advanced form capabilities that have previously been unavailable. Apps can store forms and other related data in the secure, reliable cloud system. Form data can be available on multiple systems for multiple users and can easily share evolving information in real time. Additionally, automation allows the configuration of alerts based on data inputted in real time, notifying management when further actions are needed. Mobile forms eradicate the hassle and cost of paper forms.The flexibility offered by creating, editing, and sharing forms in real-time establishes mobile forms as an advantageous supplement in any industry with field employees, notably the property management industry. Real estate agents and property managers are often seen accompanied with stacks of paper, including: contracts, evaluations, contact information, etc. Transferring these multiple documents onto a digital screen multiplies the efficiency of your daily activities. Powerful mobile forms apps give you the freedom to upload pre-created HTML forms or create your own using the easy-to-use interface. Client signatures are often required for property managers. Instead of collecting a signature on paper, transporting it back to the office, and often requiring a follow up. With in-app forms feature- reps can collect and store signatures. Save time and increase productivity by removing the inconvenience of chasing signatures. In addition to signatures, forms can store QR or barcode scans, pictures, and notes. Tackle any sudden maintenance or repair issue with customized reporting and tagged GPS location. Messaging, signature collection, QR/ bar code scanning, and photo capture capabilities can supplement any situation that requires immediate attention or assistance. Employees would have the ability to collect equipment readings in the field and trigger immediate alerts if maintenance and repairs are required. This entry was posted in Facility Management and tagged Mobile Workforce Management on - by myGeoTracking. According to a report by OIG in 2016, nearly 5% of Home Healthcare Providers (about 500 agencies in US) are at potential risk of failing due to compliance and fraudulent activities in their Billing processes. Government agencies are putting increased scrutiny on Providers’ billing practices in order to improve compliance, reduce human errors and mitigate fraud. These agencies are leveraging modern digital tools to detect fraud and error patterns in billing practices in home healthcare industry. Organizations such as ACFE point to some common patterns across most compliance failures e.g. incorrect reporting of diagnoses, billing for services not rendered etc. Human errors, mistakes in documentation and misrepresentation of field activities can lead to compliance failures and loss of revenue for providers – even if these mistakes are not intentional. These issues can be easily addressed with the help modern digital technologies and processes – mobile phone apps, cloud hosted business planning software AND automated field operations workflow to monitor any exceptions in real-time and maintain electronic audit logs. Billing for Services not Rendered: During every care visit, the attendant can collect the member’s digital signature & note via their mobile app as a proof-of-service at the time of service. myGeoTracking provides mobile forms, pictures and signature capture to facilitate this. Misrepresenting Dates of Service: Hand written notes and hours logging is prone to errors. Mobile time & attendance Apps combined with a plans-of-care forms can be used to address this issue. Apps can precisely log the date-of-service at the time the service is delivered. The billing department could then rely on this instead of the date that the claim form is signed/submitted (which is usually on a different date). Misrepresenting locations of service: use mobile app to geotag all activities at the patient’s site. This realtime location tagging can be further enhanced with automation to create alerts based on scheduled events e.g. late arrival alerts, care-provider absence alerts, entry / exit alerts from patient homes etc. This setup would then ensure that the service is delivered by the care provider OR an alternative arrangement in real-time in case of an absent attendant. All billing reports would now carry a location-tag to ensure point-of-care delivery is consistent with the patient records. As listed above, smart phone app (or Text and IVR) can be used for easy-to-generate attendance logs, accurate billing reports and audit files for home care service providers. These technologies can help agencies become compliant with State and Federal requirements while also mitigating fraud activities and improving the overall care delivery for members. This entry was posted in Healthcare, Lone Worker Safety, Mobile Employee Time Clock, Mobile Workforce Management, myGeoTracking General on - by myGeoTracking. What is Electronic Visit Verification? While the EVV mandate is a part of the federal 21st Century Cures Act, many states, like New York, have additional requirements that providers must adhere to in order to be EVV compliant. New York Office of the Medicaid Inspector General describes EVV as a “EVV is an electronic means used to capture the services provided to a Medicaid beneficiary at the point of service”. Certain home health providers whose services exceed $15 million in Medicaid fee-for-service and in addition to Medicaid care reimbursements per year. What Do EVV Requirements Mean for Your Business? Your Verification Organization (VO) and EVV does not have to come from the same vendor. 1. The State of New York does not certify or enroll EVV providers. Affected health care agencies have the freedom to choose an EVV solution that fits their needs and complies with state standards. Abaqus, Inc. is a provider of a powerful platform, myGeoTracking, an EVV solution for in-home care providers. myGeoTracking leverages the advancements in the modern technology in the smartphones/sensors, apps, location-based services, and cellular communication to provide you with a scalable and robust in-home care workforce solution to help meet EVV requirements for Medicaid compliance. While the EVV mandate is a part of the federal 21st Century Cures Act, many states, like Texas, have added additional requirements that providers must adhere to in order to be EVV compliant. Texas Health and Human Services Commission (HHSC) describes EVV as a “telephone and computer-based system that electronically verifies service visits occur and documents the precise time service begins and ends”. The state of Texas required its Medicaid-enrolled Home Health Agencies to implement the State EVV mandate by June 1, 2015, more than one year prior to the passing of the 21st Century Cures Act, and four years ahead of the federal deadline. Certain Managed Care Organizations (MCOs). If you operate within the following programs: STAR + PLUS Dual Eligible Integrated Care Demonstration, STAR Health, STAR Kids, Acute-care Fee for Service, Community Living Assistance and Support Services, Medically Dependent Children Program, Community Attendant Services, Family Care, or Primary Home Care, reach out to Texas Human Health Services to see if you’re affected by the EVV mandate. Health-care providers must use two things to record a service. After providing services, a health-care worker must use an EVV system approved by HHSC and use the clients landline or an approved HHSC small alternative device. Providers have a strict deadline to input service data. Providers must enter comprehensive entry of data into the EVV system within 60 days of when the service was performed. Providers will be assessed on their compliance with the EVV mandate. HHSC will require an EVV Initiative Provider Compliance Plan score of at least 90% for each review period. This compliance depends on following protocol when changing EVV records already in the system, using provided reason codes. Providers are free to choose their EVV provider. HHBC allows providers to choose their EVV provider as long as they comply with their technical requirements. Increasing access to advancing mobile technologies has given business owners in nearly every industry unprecedented ability to automate tasks that were once difficult and time consuming. As business owners embrace these simpler replacements, one aspect of business affairs that continues to be practiced in an archaic fashion is the use of paper forms. The use of paper forms has persisted despite their decreasing ability to fulfill their purpose. A number of cloud-based mobile apps now offer the ability for business to create their own customizable forms and send, receive, and edit them in real time. In addition, these forms can be location-stamped and be accompanied by real-time data, messages, and signatures. Digital forms via mobile apps, along with the various other capabilities they offer, come at a price significantly lower than what most business spend annually on paper alone. If you need more convincing, here are a few reasons why your business should stop using paper forms. Even with mass efforts to reduce paper waste, in 2015, the average office worker still used about 10,000 sheets of paper annually, 45% of which end up in the trash by the end of the day. Based on these approximations, businesses are spending $80 dollars per worker annually on paper alone. Without even factoring in the loss of productivity that paper forms facilitate, mobile apps already prove to be more economical by offering a number of intelligent features for a comparable annual price per employee. On average, an employee spends 30-40% of their time looking for information found in old emails or filing cabinets. Every 12 filing cabinets requires an additional employee, thus a large sum of payroll costs goes toward maintaining files. Additionally, filing this soon-to-be-misplaced information costs an average employer approximately $20 per month of payroll costs per employee. The ability for mobile apps to store these files allows employees to spend less time doing administrative tasks and more time completing their own work. More than 70% of today’s businesses would fail within three weeks if there was a catastrophic event that demolished their paper records. This is an alarming statistic for any business that relies on paper records. The hassle of paper files can be replaced and improved with the use of cloud-based storage for your business’s forms, files, and data. The real-time ability to share information and files allows for greater accuracy in records by eliminating accounting for an event long after its passing. Forms can be accessed through the simple interfaces of these mobile apps. The real-time ability to share files and information further ensure greater accuracy in records by foregoing delayed post-action reports. In unexpected field scenarios in which different protocols need to be followed, the capacity for real-time communication proves helpful in providing necessary resources for any situations. Aside from being environmentally conscious in your business practices, shifting away from paper forms is the economical decision that will take your business further by cutting costs and boosting your productivity. While the EVV mandate is a part of the federal 21st Century Cures Act, many states, like Louisiana, have added additional requirements for providers to follow in order to be EVV compliant. The Louisiana Department of Health describes EVV as “a computer-based system that electronically verifies service visit occurrences and documents the precise time services begin and end via smart devices”. Louisiana has already successfully used EVV for center-based, vocational, and transportation services since 2016. In line with the 21st Century Cures Act, the state expects to implement EVV for Medicaid Home and Community-Based Services by multiple deadlines, ranging from November, 13, 2017 through February 19, 2018, depending on regions. The encouraged transition date is fast approaching, making it important for all relevant health care providers to be up-to-date on how to navigate EVV requirements in the state. Your EVV implementation deadline depends on your region within the state. Providers will pay minimal personal costs for the initial implementation of an EVV system. The state will cover all costs associated with development, implementation, and training of an EVV system. In addition, ongoing transaction costs will also be provided by the State. Your business will be responsible for providing smart devices. Smart devices will not be provided by the State. The Louisiana Department of Health believes “utilizing smart devices with internet access is at least cost neutral in many cases and will represent a cost savings to providers”. Some EVV solutions can be accessed through the personal phones of employees, thus eliminating the additional purchase of devices. The Louisiana Department of Health allows providers to choose their EVV provider as long as they comply with their technical requirements. However, the SRI system is the EVV solution designated by the Louisiana Department of Health. If providers choose to use an alternate EVV vendor, the EVV system must pass a LaSRS data integration process prior to the implementation deadline.